We are back with two shows on 1st of December! 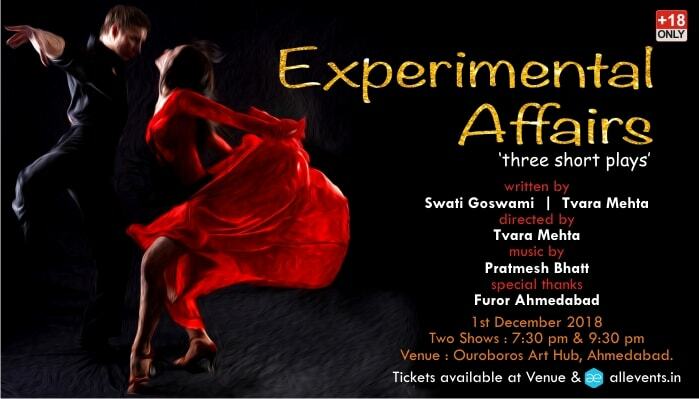 Experimental Affairs is a collection of three short plays. A dark comedy that highlights the basic equation between humans and technology as both complicated and contradictory. Consistent tech advancements cover the quest to find love and companionship in a veil. Humans remain the same, fear changes forms. A musical tale of 2 individuals analysing childhood experiences and relationships that shape their personality and determine how they interact with their external environment. Come for some drama, some dance and ample depth. Story of our lives that exploits an external perspective to showcase the conflict within. Why we dislike what we do? Why we follow the wrong advice or wrongly blame the right person? Find out this and much more in ‘Experimental Affairs’!